While I could spend hours waxing lyrical about the joys of tights, I understand they're not always the easiest thing to style. Annoyingly, there's no exact formula, but I generally find that most longer dress styles look good with thicker tights (luckily midis are everywhere at the moment). When it comes to wearing hosiery with shorter dresses, it's best to stick to black boots to create a seamless line—although I do think some of this season's vintage-inspired minidresses would look great with snakeskin boots. Need a bit of inspo to help you on your way? 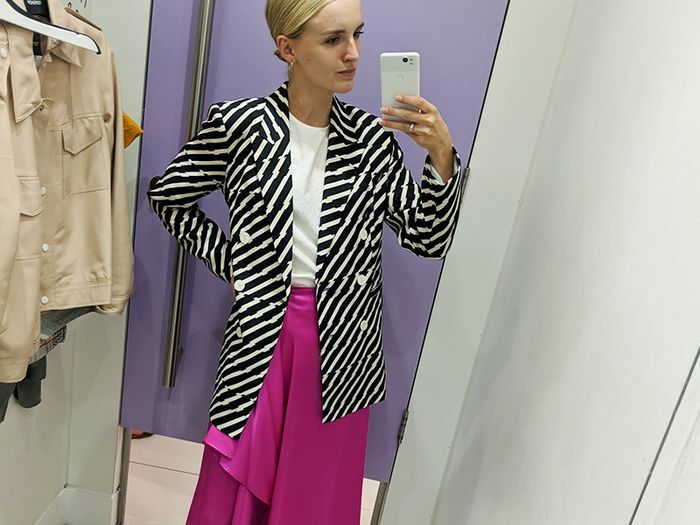 I went to some of my favourite high-street stores to try on the dresses that look stylish with tights. Scroll down to see and shop my edit. Style Notes: The bold print, statement ruffles and asymmetric cut of this & Other Stories midi dress instantly caught my eye. 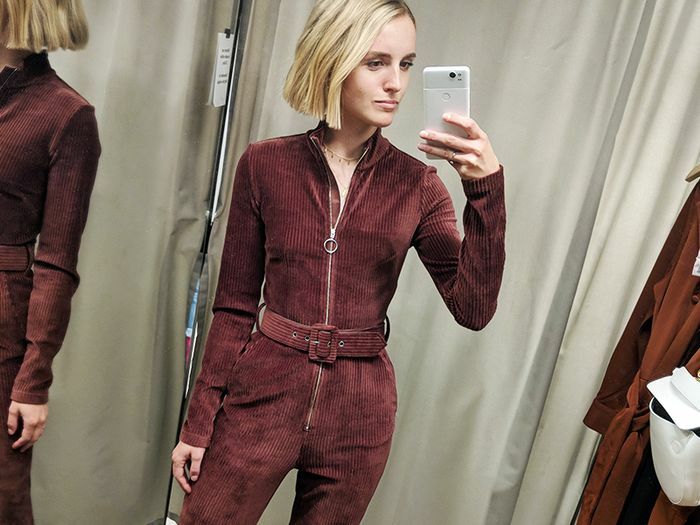 I was happy with the proportions, however, I found that the fit was slightly more snug than expected (particularly around the hips), so I would consider buying a size up. Style Notes: Leather dresses are on their way to becoming this season's look du jour, and this faux-leather iteration from Warehouse gets my vote thanks to its Western-inspired details. Style Notes: This sheer stripe midi dress is perfect for the colour ambivalent (aka me), as it feels like a more approachable, autumnal shade of orange. I also love the billowing sleeves, which offer a high-end finish to the whole look. Style Notes: This polka-dot mini is an '80s-inspired dream. While it would be perfect as a party piece worn with heels, I enjoyed layering it over a skinny roll-neck for a more laid-back aesthetic. Style Notes: I wasn't sure about this dress when I saw it on Warehouse's website, but it's far better-looking IRL. The fabric hung really nicely and didn't feel cheap like some silky high-street pieces do. If I could change one thing, I'd make the sleeves full length. Style Notes: I wouldn't usually go for a maxi knitted dress, however, I can't resist a zebra print (plus, it'll be super warm in winter). This is a rather tight fit, but I like how the dress flares out at the bottom to balance out the top half. Style Notes: This H&M look is so Little House on the Prairie, and I'm not even sorry. It was born to be worn with lace-up boots, woollen tights and a heritage coat. Style Notes: This silk midi is the sort of piece Arket has been doing so well since its inception. If you've got an Arket dress lingering from the summer, you'll be happy to hear that they work just as well with tights for the colder months. Steamer required. Style Notes: Topshop just keeps knocking it out of the park with these expensive-looking ruched party dresses. I'm obsessed with the green-and-black print of this long-sleeved midi, which I've paired with a roll-neck for extra warmth. Style Notes: This & Other Stories cord dress was one of the few shorter styles I tried on and loved. I purposefully picked it because it works well with a long sleeved top layered underneath (this sheer polka-dot top does the job nicely). Also, this is the sort of dress that actually looks better with tights. So Alexa Chung. Style Notes: Cutting off just below the knee, this & Other Stories checked dress is a good option if you're worried about longer styles swamping you. The pleated and ruffled neckline skirt is so pretty. Plus, the check is very A/W 18. Style Notes: The perfect respite from the bold prints and vibrant colourways. Only Arket could create a knitted dress this chic. I'm a big fan of the fitted neckline and was impressed at how the brand managed to create shape with the woollen fabric. 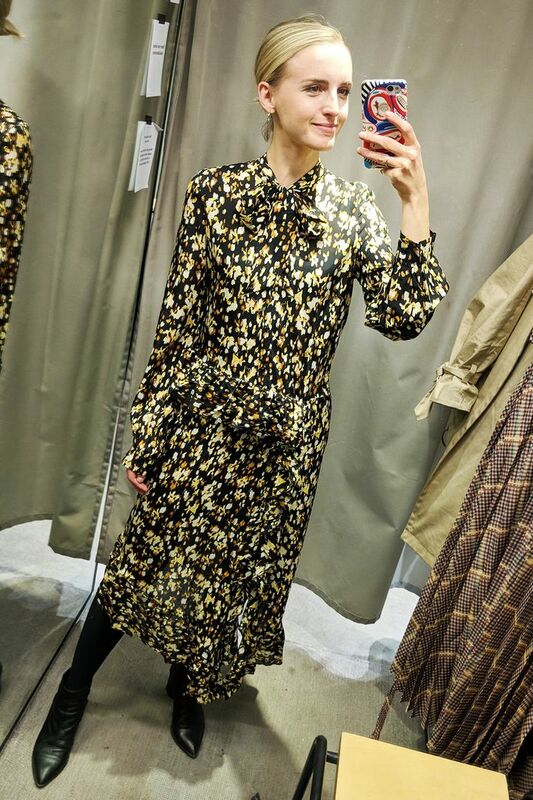 Style Notes: This drop-waist dress from H&M might not be for everyone, but I like its vintage vibes and think it offers a good mix of distinctive detailing. Style Notes: I've had my eye on this zebra-print silk dress for months now, and it's the perfect example of how a dress can be adapted for all seasons.